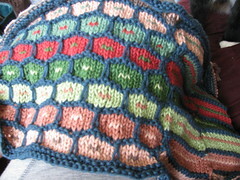 I finished this a bit ago, and , well, like much of the knitting, didn't quite get around to blogging about it. When I saw the Blooming Flowers Cotton Scarf in Interweave, I was intrigued. When I read through and realized it was knit in the round and later severed, I was more intrigued. Now, I bought new yarn for this, but other than the base color (and depending on the stash, even then) it really doesn't use large quantities, so it could be a great stash-buster pattern. 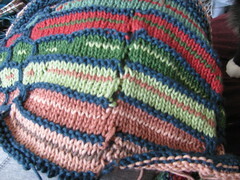 I used a combination of Rowan Handknit DK Cotton and Frog Tree Pima Silk. 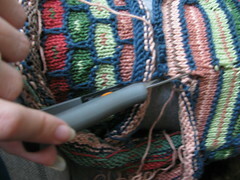 The scarf is knit length-wise and, because of the later cutting means very little attention needs to be paid to how the yarn gets carried for the color work. 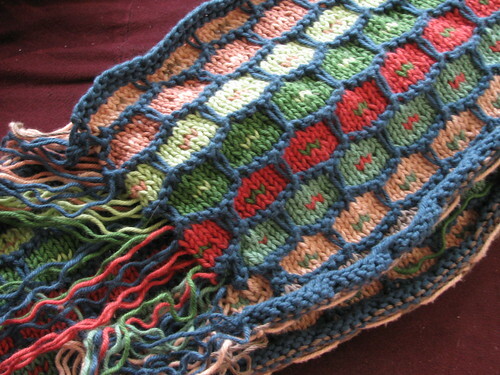 The color work is achieved with slip stitch knitting and works very similarly to the Ballband dishcloth. It was an easy pattern and only required real counting every few rows. For those with a fear of steeking, this is not really steeking because in steeking you are trying to preserve the knitting you are cutting apart. Here, less so.